Last night, I learned something new from my trader friend, Nowell. I’ve been using COL platform for more than a year now, but it seems, I haven’t explore the website yet, that there are more functionalities it provides for COL users. Anyways, this one that shared by Nowell, is simple, yet will be very useful for me, since I’m not a day trader, placing an order that would last for 60 days, definitely saves time and ensure that I can buy stocks based on my estimtaed fair value of the stocks. All this time I thought, that I can only place an order (bid or asking price) that will last for a day. Since I have a full-time job, I normally, place an order during the morning, and if it’s not executed that day, I would do the same the next day, and the next day and the next…. Yay, so thanks Nowell, for sharing this another “Term” option called GTC (Good Till Cancelled) Order , meaning your order is valid for 60 days, unless you cancel it. This is benificial for SAM and Value investors. As you can place orders that is valid for 60 days. 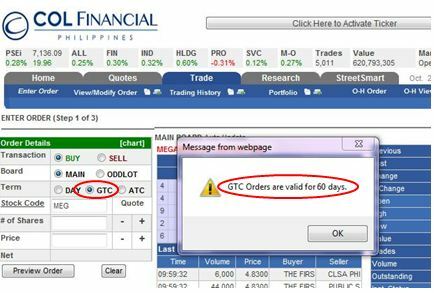 The COLFinancial GTC orders are limit orders which are valid for sixty (60) calendar days. For example, if the GTC order is entered on November 26, the order will be valid until February 25. If the Valid Until date is a non-trading day, it will no longer be valid on the next trading day which follows. For example, if a GTC order is valid until Feb 25 which is a Saturday, on Feb 26 (Monday) which is the first trading day that follows, the GTC order will no longer be valid. GTC orders can be issued through the Order Entry function on the ‘Trade/Portfolio’ section and can be entered during trading time when the market status is either in Pre-Open, Open, or Trading at Last only (from 9:00AM to 12:10PM). GTC orders cannot be entered/modified/cancelled during off hours as the Exchange needs to be open to accept and validate GTC order requests. Lastly, like any normal order, it cannot be cancelled/modified during (9:15AM-9:30 AM and between 11:59AM-12:00PM) as all orders including GTC’s have to follow the Exchange’s order regulations on cancellations and modifications. Another “Term” option is ATC (At The Close) Order. 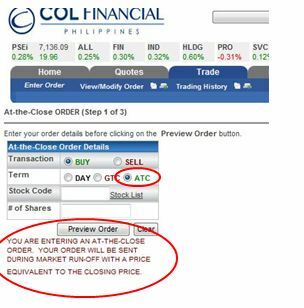 The COLFinancial At-the-Close order allows you to enter an order that will be sent to the Philippine Stock Exchange for execution during the market run-off period (12:00 PM-12:10 PM) at a price equivalent to the closing price of the stock. The ATC order must be sufficiently funded with cash or stocks to remain a valid day-only order. User must specify the order to be of type ATC. ATC orders only require the side, stock code and volume to be entered by the user. The price at which the order will be sent during RUN-OFF would be dependent on the closing price of the stock. ATC orders can be entered anytime before the market state becomes RUN-OFF. 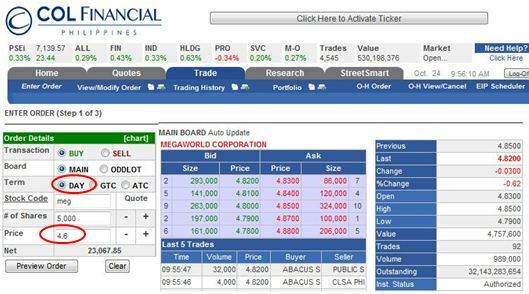 Once the market state becomes RUN-OFF, all ATC orders which have sufficient funds or stocks will be sent to the market for execution with a price equal to the corresponding closing price of the stock. Placing an ATC order does not guarantee that your trade will be partially or completely executed. Your order’s execution will be dependent on your place in the order queue and the availability of sellers at the closing price.